This workbook will be your essential guide to the next step in your life as a parent. Whether you are considering working from home, setting up a business or returning to the workplace in your old job or a new one this book poses the questions you need to be asking yourself now. 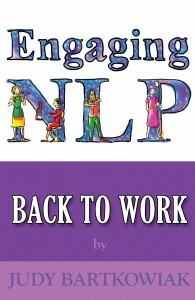 It starts by introducing you to the principles of NLP, the beliefs of excellence. Each of these is explained with relevance to your current life stage. The first main chapter is called Identity. It may have been a while since you thought about who you are, who you want to be. Are you predominantly visual, auditory or kinaesthetic and how could that influence the career or work choices you will make? The second chapter is very important , it is about self-esteem which you will surely need whatever you decide to do. You will be asked about your skills and get the chance to see yourself as others see you. The Time Line and Perceptual Positioning are both great techniques for discovering skills as is Modelling which is the third chapter in which you will learn how to benefit from the skills of those around you. Every experience we have has learning potential for us, including negative experiences. Instead of feeling we have failed when things do not go well or if we are dissatisfied with our lot in life, reframe this by looking at it in a different, positive way to find the positive intention which is for you to learn from it. It is interesting how we (particularly women) seem to accept criticism (overt or implied) more easily than we take on compliments. Feedback is a resource to help us learn what is working and what could be even better. If you are considering going back to work or changing job, you will be networking, attending interviews and getting feedback from all these situations as well as from your partner and family. How you use this feedback is your choice. No-one can make you feel an emotion such as guilt, this is your choice. When we notice a quality (or a failing) in someone else this is because in some way we have it too which is why we can recognise it. When you observe a quality you admire in someone else, ask yourself, ‘where do I have this quality?’ It may be in another aspect of our life. Be curious and explore everything you do and find it. Later in the book we’ll talk about how we can transfer the quality or skill to where we need it now. How often do we say ‘I’ll try to find a job’ or ‘I’ll try to persuade my boss to let me work part-time?’ Are we acknowledging that we won’t succeed? Do we really mean to do that thing or are we just going to ‘try’ and do it? There is built-in failure in the word ‘try’. Chapter four invites you to set compelling visions for your future and then in Chapter five you can start playing with them as you consider your options. It is important as you return to work to be able to process feedback as learning rather than be downhearted when you have a setback and the last chapter on Time Management helps with priorities and values.